Customer feedback is one of the key drivers for our business. It helps us enormously to constantly improve our processes and solutions and, ultimately, to realise our customer-focused vision: “The Contractor is King”. As part of our commitment to improve your customer experience we have listened to your comments and feedback from our recent contractor interactions (Focus Group, Survey, and Contractor Evenings). As a result we have now created a dedicated Customer Care team within the payroll function to help resolve and improve the communication process in relation to compliant expenses. This was a direct result of your feedback. The expense process was the most common issue identified by you and so we have now implemented a dedicated 3- person team who are available to discuss your queries and concerns in relation to expenses and also to help guide and advise you along the way. The team is led by Christopher O Callaghan and ably assisted by Dean Horton & Cliona Conway. 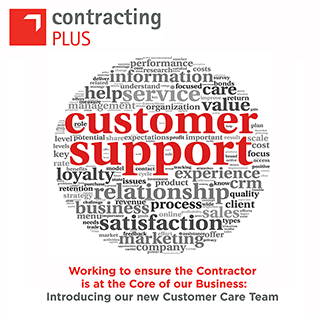 The team can be contacted via email at expenses_team@contractingplus.com or any member of the team can be reached on 021-4839339. We actively seek feedback from you. Please send us your questions, suggestions or feedback. Call us, talk to your new customer care team, your account manager, tweet us or email us. Whichever way you choose to talk to us, we value your feedback and look forward to giving you the best possible customer experience.